On October 28, 2017, I was home with my husband and 3 daughters ages 21, 18, and 13. What began as a normal day turned out to be anything but. Around 3:30 that afternoon my 13 year old daughter, Ally, was laughing one minute and in a matter of twenty minutes she complained of the worst headache she’d ever had, to getting sick and then began to lose consciousness. She was taken by ambulance where she had an emergency craniotomy (brain surgery) for 4 plus hours and came out in critical condition. She was on life support for almost 2 weeks following the surgery. She had what was called an Anteriovenous Malformation in her brain which spontaneously ruptured that afternoon. She was a very healthy child for 13 years and as you know they don’t give healthy kids CAT scans or MRI’s so we had no idea that she had this AVM in her brain, most likely since birth. From that moment my entire focus shifted to her and her survival and then ultimately her recovery. I was off work from October 28, 2017 until April 1st, 2018. Given that we are a two family income, things became extremely difficult, financially. Another flight attendant messaged me to ask if I knew about CAUSE and all I knew was that the money I paid for the candy cane scarf and United tote bag went to this foundation. I’m embarrassed to say that I didn’t know much more than that because I hadn’t been in a position of needing help prior to that day. 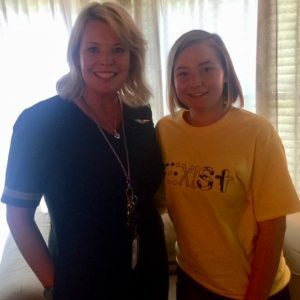 CAUSE is an organization run by United Flight Attendants for the sole purpose of helping other United Flight Attendants. Although I was unable to work, I could not receive unemployment since I was still employed and I could not receive disability since I was not the patient. CAUSE stepped up immediately upon learning about the situation and has made all of the difference throughout this journey. When faced with something like this the smallest things can seem daunting, but Judee Greenspan with CAUSE walked me through the process step by step. I, like most of you, thought things happened to other people and when things happened to other people I would express sympathy and concern and then thank God that it wasn’t me. On October 28th, my entire world changed and with it so did my perspective. I’d like to ask you to please consider donating to CAUSE because you never know if or when you will be in a position of needing assistance. If each of us donated just a $1 a paycheck that would be $50,000 per month going to CAUSE, which is set up and there for the sole purpose of helping us. I would like to end by saying that my daughter not only survived, but is doing amazing. We still have a lot of follow up appointments on a weekly basis and she is currently receiving therapy for PTSD, but I am beyond thrilled to say that she does not have any cognitive deficits or physical limitations and her personality, which is my favorite thing about her, is still as wickedly funny, if not more, than it was before October 28th, 2017. To Judee Greenspan, Amy Hurst-Kownacki, and to all of those who volunteer their time to CAUSE I will never be able to adequately expressed how profoundly grateful I am for your time, support, kindness, and above all prayers throughout this. From the bottom of my heart and Ally’s THANK YOU!!!! The Cause Foundation was such a blessing to me in my time of need. I suffered a back injury, which required surgery and was off work for approximately 18 months. I was overwhelmed and didn’t know how to make ends meet. I had utilized every resource available to me. I couldn’t even provide the essentials for myself and nearly lost my residence. Another flight attendant mentioned The Cause Foundation to me. I contacted them and immediately felt that I truly had someone who cared about my circumstances and what I was going through. I cannot praise this organization enough. I never fully understood the importance of flight attendants helping one another until I, myself, was desperate for assistance and had nowhere else to turn. I am so grateful to The Cause Foundation and those of you who have contributed in order to truly make a difference in the lives of others. Only God can know how much you have meant to our family. All my children thank you, too. Wayne, Doug, Becky, Jennifer, George, Robin and Jon. I wanted to drop you all a note of thanks for your help and support for me during this difficult time in my life. The $1,500 check you sent me came just in time. I truly do not know what I would have done without it. It was such a relief to know that, in addition to worrying about my mother and caring for her, that I didn’t have to “stress” any longer about where my next dollar was going to come from. I’ve tried so hard to clean up my credit since my divorce so that I could eventually buy a home of my own, by myself, and all of those dreams and hopes were almost shattered and made unattainable. I only wish I had the courage to ask for help earlier. Thank you so much for your generous “love” grant to our family. Needless to say, our financial affairs have been stressed. Your benevolence is much appreciated. Thank you for all the support you gave me before and after my heart transplant. So sorry it has taken me so long to say these simple words of thank you. While I was at work I always tried to give, never knowing I would one day have a need for the help you give. Starting November 1, 2001 I will be receiving a monthly check from social security. Though the amount will be far less than my salary, it should be enough to cover my basic monthly expenses. Please do not send a check in November, another Flight Attendant could use the help. To all the Flight Attendants that contributed to The CAUSE Foundation®, I say, Thank you. CAUSE’s gift and your letter of condolence on the loss of my daughter, Amy. It has been a very difficult 3 months, but it is comforting to know that the love and friendship that Amy shared with her fellow Flight Attendants. Your gift is so greatly appreciated. Thank you for sharing and for your sympathy. Our lives will never be the same, but it is so comforting to know that there are so many caring people in the world. Thank you so much for your financial support with the CAUSE grant during my husband’s treatment for lung cancer. Without your support, our family’s needs would’ve been much greater. Ron is now at peace and pain free with Our Heavenly Father. I will begin flying part time in February. With faith in God, the love of family and friends, and hope, peace will return to me. I just wanted to take this opportunity to express my appreciation for all the assistance I have received from CAUSE during my recent illness of breast cancer. I could not have made it without your support. Thank you so much! I am back to a somewhat regular schedule but during the next year I will need 1 more surgery, possibly 2. I live day to day. If I can provide any assistance to you, please call me. Without your help I would have never made it – Thank you, thank you, thank you, thank you. I thank you for all you’ve done and for all you do. A special thanks to all of you! The enclosed check is being sent on behalf of Dana De Groot, as a portion of her life insurance policy. These were her instructions, and I’m thrilled to do this. Perhaps you are aware of how much Dana appreciated the help given to her by CAUSE. You may also know that it was extremely hard for her to take money from anyone, including family. I used to jump for joy when she cashed a check I sent her. Normally, it would be returned or torn up. So, please know that your organization made a big difference in her last months of life. Now, perhaps another deserving employee can benefit from Dana’s donation. I want to thank those who attended Dana’s service in Chicago, too. I will be eternally grateful for the many ways United Airlines has come to our support. Just wanted to thank you and The CAUSE Foundation® for the outpouring of care and concern for the families of the attack on September 11th, 2001. Nothing can bring Bob back to us, but knowing that there is so much love for the families of the airlines personnel brings some comfort. The financial support is much appreciated. Yes, our lives have changed drastically and it is very heartbreaking this time of year. Most importantly, I am eternally grateful for your continued support. I could not have survived without the generous help I have received from The CAUSE Foundation®. As a woman alone with children, the relief you have provided me with is immeasurable. More than that, I owe a debt to you personally and the Foundation and the Union as a whole transcends re-payment with money. I want to provide volunteer time and energy helping with anything I can. When I return to work, I am going to increase my donation amount and be available for any type of help for the organization that is needed but before that, right now, I can type or make calls or do many things to help even though I’m confined to sitting. Please consider my offer and let me help in any way I can. My Grandmother had an expression for times like this: “who knew angels flew so low”. Thank you for being so kind through this hard time. I am very thankful that you let my mom stay home with me after my dad died. I needed my mom to comfort me, and I was scared for her to leave. I sleep very well knowing she is with me. And I thank you again for making this possible. I hope you like this poem I am giving to you. You shall wait for the family and I. Precious Angel in the sky. But while I’m here on earth. You whisper softly in her ear. Through my joy and through my tears. You left me when I was only nine.